Hard as it is for me to believe, Frampton Comes Alive was released 35 years ago. It was the must have album of the day and I remember everyone rushing out to get the double disc vinyl album eager to recreate the concert experience of a Frampton show. Back in the day of stereos with record changers, I remember stacking the two albums on the turntable spindle ready to lose myself in the tunes. The albums were even manufactured for this with one disc having sides 1 and 4, the other sides 2 and 3 so the listener would hear them in the correct order. It quickly catapulted to the best selling live album ever in the United States. FCA still ranks in the number 4 position of best selling live albums. Frampton is currently doing a FCA tour playing the album and clocking in at 3+ hours per show. I'm hoping to get tickets to an upcoming show near me. Anyone out there willing to cross their fingers for me? Peter has enjoyed a long and varied career, but for this post I am only focusing on the Frampton Comes Alive songs in their playing order on the album, but some alternative performances. Something's Happening- Track 1 of FCA with an introduction from Bill Graham himself and this show from the famed Winterland Ballroom in San Francisco. Doobie Wah- Peter calls it getting funky. It reminds me of Jerry Garcia's style in the Grateful Dead on this particular song, especially the solos. Show Me the Way- I can't recall seeing anyone use a Heil Talk Box before Frampton. It was the coolest thing ever...still is. Bob Heil built it for Peter and gave it to him as a Christmas present one year. It's a Plain Shame- Filmed this month, this video is not the song in it's entirety, but gives you a good feel for the 60 year old man who can still rock. I've been fortunate enough to have seen Peter Frampton in concert a number of times over the years both at his peak in the 70's and more frequently after that time. I am never disappointed. This is a man who loves what he does for a living. He is having so much fun on stage with his musician pals it's infectious. I smile the entire time I watch him play. All I Wanna Be (Is By Your Side) This beautiful rendition is from this past summer and showcases his technical and soulful guitar playing and how he can make a song that is 35 years old sound fresh and relevant. Shortly before this concert tour launched, all of Frampton's guitars and his band's equipment was destroyed in a flood in Nashville,TN. 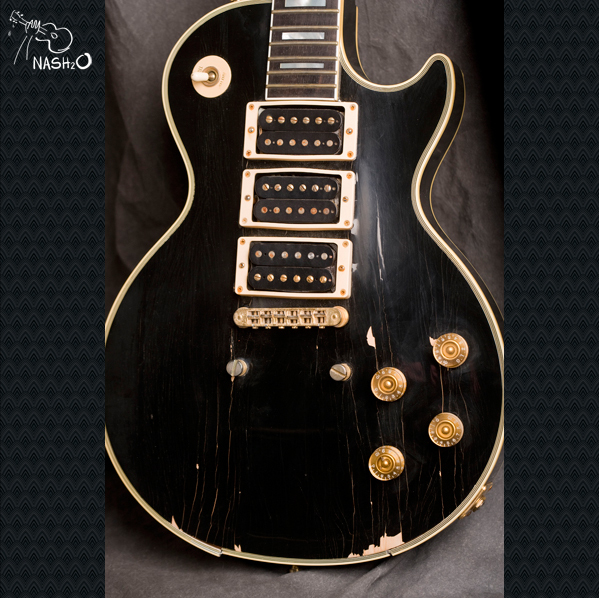 His beloved Les Paul, seen below, was waterlogged and damaged beyond repair. 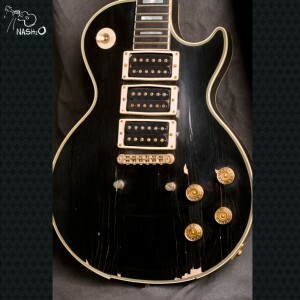 He later auctioned it off as did other musicians who had their instruments stored in the same Nashville facility affected by the flood. Wind of Change- A nicely made fan-based video of the title track song from Frampton's first solo album in 1972. This rare live version is from the Frampton's Camel album which later ended up on side 2 of FCA. Penny For Your Thoughts- A bright instrumental from side 3 of FCA. This live version is from 2007. (I'll Give You) Money From his self titled album Frampton in 1975, the song ended up as track 2 side 3 on FCA. Shine On- This version was recorded when Peter reunited with his band mates from Humble Pie in 2001 to mark the 10 year anniversary of the death of Humble Pie guitarist and singer Steve Marriott. Jumpin' Jack Flash- Yup. He did it. He covered a Stones song. And it's so long this live performance was divided into two videos on You Tube. Part 1. Lines On My Face- The PBS performance in 2009. This is my favorite song from the FCA album. It's tender, beautiful, and I feel a longing in the notes. Peter makes that guitar weep in this version. I adore it. Do You Feel Like We Do? This song was originally released in 1973 on the album Frampton's Camel, the name of his band at the time. On the FCA album it was released as the third single, edited down heavily from it's original 14 minutes to 7 minutes--still considered too long for many radio stations at the time who did their own editing to make the song a better fit their format. The golden curls are long gone, but the soul, the spirit, the consummate musician remain intact. Attend a Frampton show and you will see a man who clearly loves being on stage in front of his fans. The performances are always fresh, fun, and magical. One of my most memorable Frampton concerts was October 26, 2003 at my favorite venue The Fillmore in San Francisco. I stood at the foot of the stage all night close enough to touch his Framptone. No, I wasn't being inappropriate. The Framptone is a talkbox guitar tool used for instrument/voice morphing effects and is produced and sold by Frampton's own company. all images from bing.com, except the last which is from...me. P.S. I saw him in August on this tour in San Francisco. It was an amazing night. The show was digitally recorded that night and we were able to purchase a cd of the show we had just heard on the way out of the venue. Fantastic!